What language was the inscription on the Doors of Durin written in? I, Narvi, made them. Celebrimbor of Hollin drew these signs. Now that is clearly Sindarin. In fact, it seems to be very bog-standard Sindarin, with no unexpected features. Yet Frodo cannot read it. In other words, the words aren’t just written in a different alphabet, they’re in a different language. But what language? As far as I know (and I may be wrong here), all the Ñoldor had adopted (dialects of) Sindarin long before the Second Age when this inscription was made, and the illustration (supposedly taken straight from the Red Book) is in Sindarin also. Frodo knew a fair bit of Sindarin, and considering the entire Company had just come from Rivendell where it is the native language (more so than Westron), it would be very odd if Gandalf referred to Sindarin in such an odd, roundabout way, rather than just calling it Sindarin. 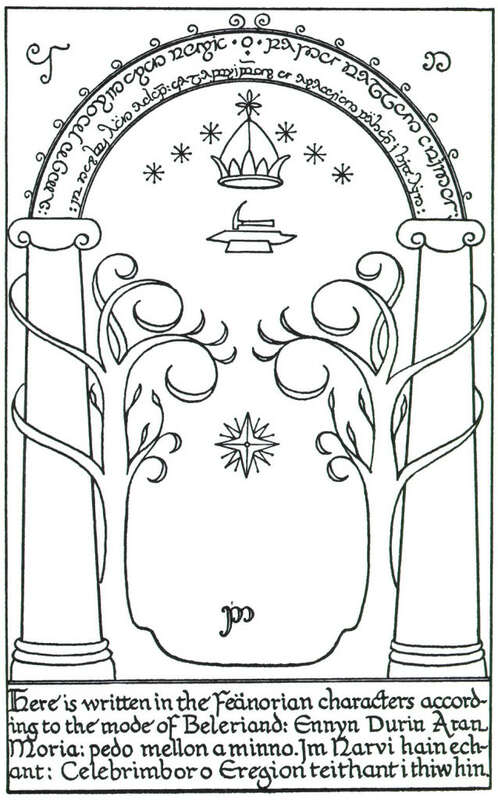 The accepted answer to this related question suggests that the anachronistic use of the name Moria in this inscription may be due to the scribe/illustrator of the Red Book having substituted the older Elvish name Hadhodrond for the more commonly used and widely known Moria; perhaps, then, the entire inscription has been translated into Standard Sindarin from whatever language (presumably closely related to Standard Sindarin, at the very least a common descendant from Old Sindarin) it was originally written in. Has canon ever addressed this? Did Celebrimbor not speak Sindarin natively?1 What is this “elven-tongue of the West of Middle-earth in the Elder Days”, then, if not Sindarin? Alternatively, was Gandalf just being inaccurate when he used the term “elven-tongue”? Should he have said “written in the script/characters/style of Beleriand in the Elder Days” or something like that instead? 1 I’m aware we don’t know much about his early years, nor even if he was born in Valinor or Middle-earth. The name Celebrimbor is Sindarin, but may not have been the form he actually used himself, similar to how Virgil did not call himself Virgil but Vergilius. ... And it came to pass even as Thingol had spoken; for the Sindar heard his word, and thereafter throughout Beleriand they refused the tongue of the Noldor, and shunned those that spoke it aloud; but the Exiles took the Sindarin tongue in all their daily uses, and the High Speech of the West was spoken only by the lords of the Noldor among themselves. Yet that speech lived ever as a language of lore, wherever any of that people dwelt. From shortly after the time that the Noldor returned to Middle-earth, Sindarin was the only language spoken daily and in public by any of the Elves. So Gandalf is certainly technically correct when he makes this statement. They spoke together in soft voices, at first using the Common Speech, but after the manner of older days, and then changing to another language of their own. To his amazement, as he listened Frodo became aware that it was the Elven-tongue that they spoke, or one but little different; and he looked at them with wonder, for he knew then that they must be Dúnedain of the South, men of the line of the Lords of Westernesse. Why then would Gandalf phrase his response to Frodo the way he does? The West-gate inscription illustrates a mode of 'full writing' with the vowels represented by separate letters. Gandalf, who's undoubtedly familiar with the extent of Frodo's knowledge of Elf-languages, may simply be reassuring Frodo that the words are in a language Frodo does know. There's no way of telling, given that he himself dismisses the wording so quickly. Not the answer you're looking for? Browse other questions tagged tolkiens-legendarium the-lord-of-the-rings languages or ask your own question. How do you write “Speak friend and enter” in Elvish characters? Is the ring poem slightly inaccurate? Who wrote it? Was Sindarin more commonly spoken than the common tongue in Gondor? Why would Bilbo agree to arbitration in the Khuzdul language?